Zarbor means woman in Hokkien. My friend, Jessie suggested this title. Loaned it to the school it for a year at the School of Art and Design gallery, to represent Chinese ink specialism. This work questions the perception of women and femininity across Eastern and Western cultures and the universality of such values by appropriating Nuremberg Woman Dressed for Church (1500) by Albrecht Dürer, and truncated lines from 《千字文》 or Thousand Character Classic, including: (Line 1) 天地玄黃 宇宙洪荒 which roughly refers to “(when/since/just as) the world world was created” and line (Line 21) 女慕貞絜 男效才良 which roughly means “Females are admired for chastity and male aspires for talent and goodness or capability”. The rest of the inscriptions specify the time, venue, and by whom the work was executed. My classmates and I have been having trouble getting the right kind of paper for our Chinese calligraphy practice. Most of the stock in local stores is made from machine now, but we want handmade paper because we like the way it takes ink. The store says that their factory don't produce the handmade paper anymore as it's not as profitable. We used to get them $6 for 100 sheets or so. Came online to look around and found this pretty video on the making of Xuan paper. These are large format papers for artworks rather than practice. The basic ones costs about $2 per piece. But the video makes me wonder how many people depend on these pieces of paper as a livelihood. 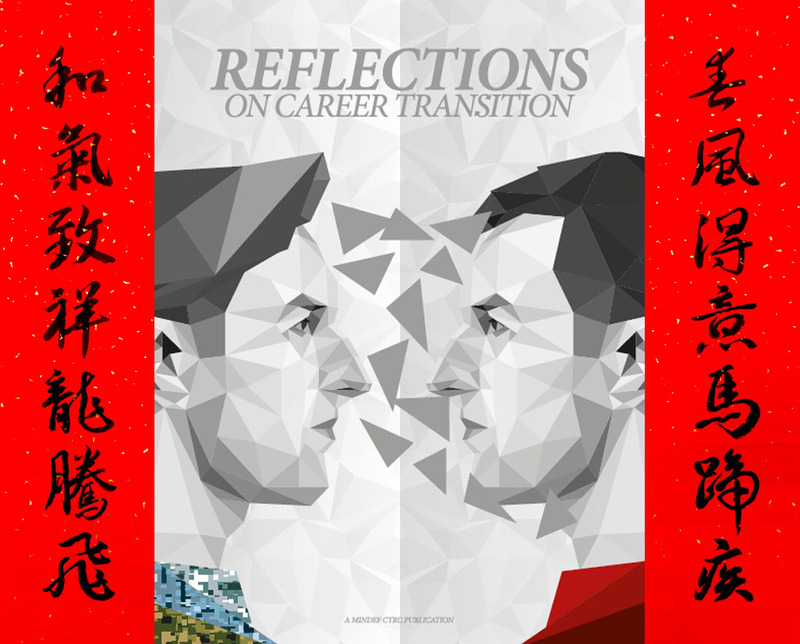 Career Reflections on Lunar New Year! The turn of the year is also a time to review our aspirations and reflect on our careers and other priorities. Reflections on Career Transition is a guidebook that may help you consider your career progression and change. Although designed for militaries moving on to new careers, this book contains reflective exercises, career tips, and insights relevant to all. Check out the free EBOOK here now! Or read more about the guidebook here. Here's wishing you a very happy, meaningful, and fulfilling new lunar year ahead! I will try to put up translations of the text, and more information on calligraphy by-and-by. I hope this will motivate me to persevere in my studies. Inspired by Sean and Levene, and along with V, I finally went to get a set! Hope to put up some works soon, but i will need to put in a lot of work to get the proper hang of it. And I also hope to develop a section showcasing my Chinese calligraphy works on this site. There, I've come out and said it, now I must really get it done. Latest developments and random inspirations.